They are characters that seem drawn from either the distant past or some future dystopia, figures out of the mythic American west, hacking up meat and chopping wood, clad in buckskin, fur, and plaid, the occasional baby slung over a hip. 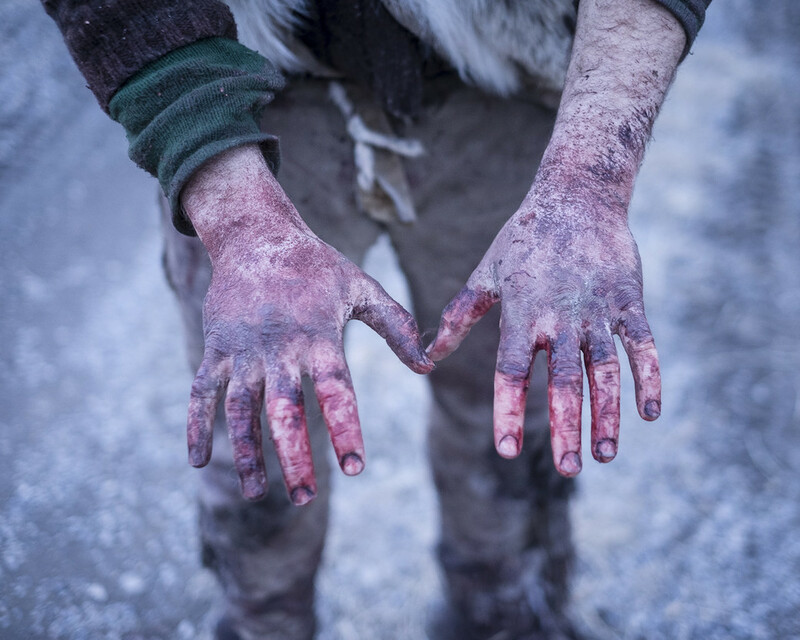 Their hands are slopped in blood and their encampment dotted with stretched buffalo hides and pots of bone broth boiling on woodstoves, the scenes bracketed by imposingly snow-capped mountains. These are members of the Buffalo Bridge Project, a group of primitive skills practitioners who migrate to southern Montana every winter to assist Native American hunters in an annual buffalo hunt. 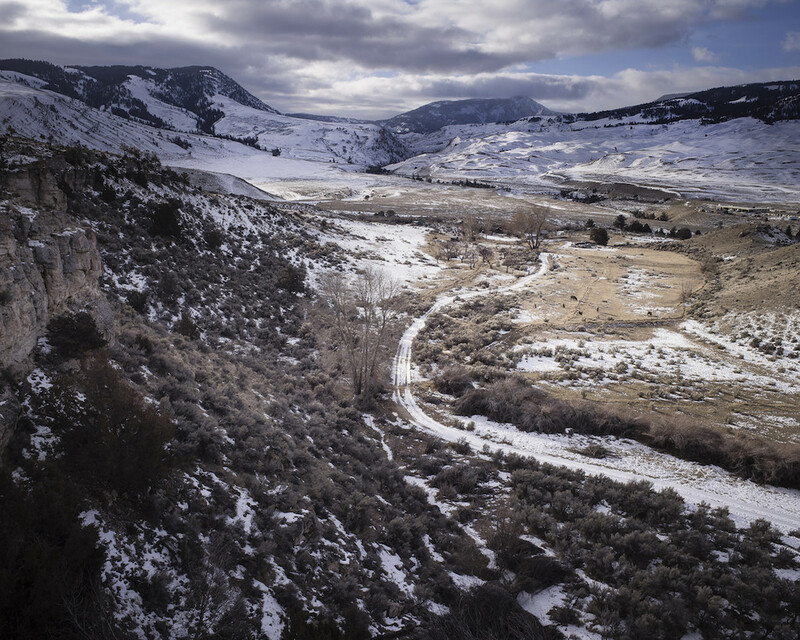 The hunt is allowed under the auspices of the 1855 Hellgate Treaty, though it has only existed in its current form since 2006, when tribal leaders convinced the state of Montana to honor the treaty and restore their hunting rights. It takes place mostly in Gallatin National Forest, near the town of Gardiner, just north of Yellowstone National Park. 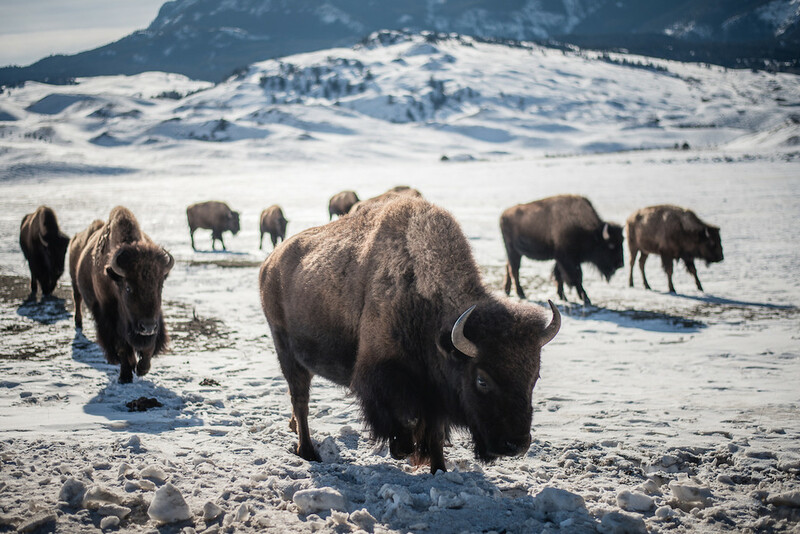 Bison roam outside of park boundaries in winter, into lower-elevation grazing lands, where members from five western nations—the Umatilla, the Nez Perce, the Confederated Salish and Kootenai, the Shoshone-Bannock, and the Yakama—shoot them in specially designated hunting zones. 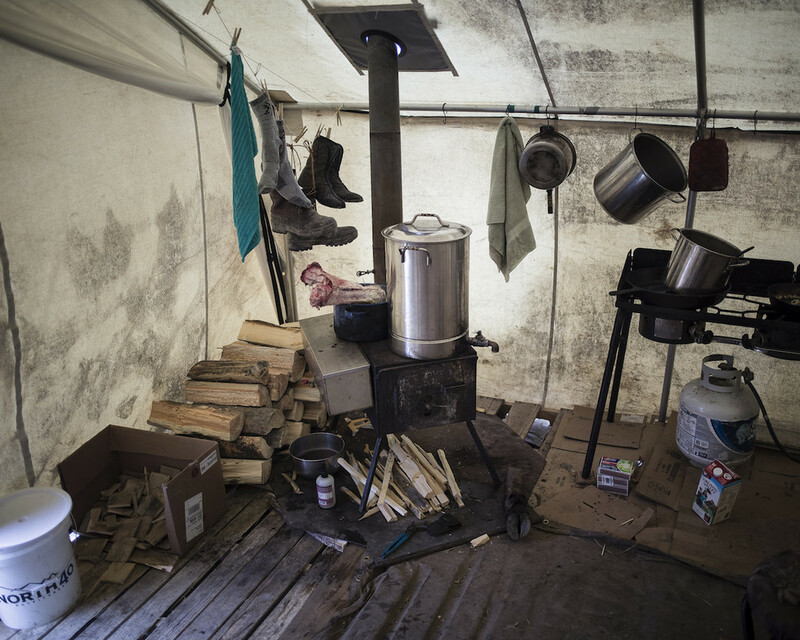 Every February, as the hunt approaches, members of the Buffalo Bridge collective arrive from their homes all over the Western U.S. and set up camp on land they rent from a nearby rancher. There they wait for an opportunity to be useful. And such opportunities abound. 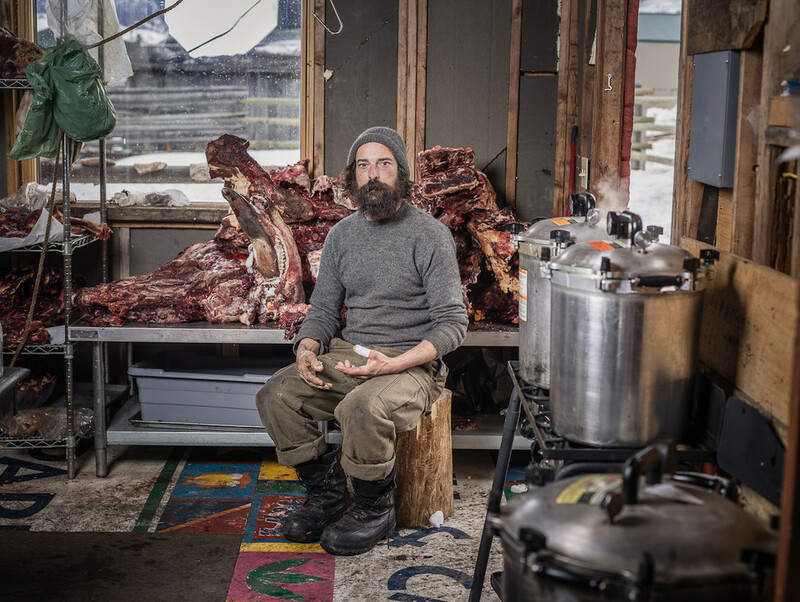 The animals are enormous—one-ton bulls are not uncommon—and skinning, gutting, and breaking down the carcasses takes a tremendous amount of work. The Buffalo Bridge crew is made up primarily of people who live close to the ground year-round, holding to their own code and making use of what others would discard. They’ve dedicated themselves to building a utilitarian skillset, and have worked hard to forge alliances with Native American hunters, who generally view them as a welcome addition. 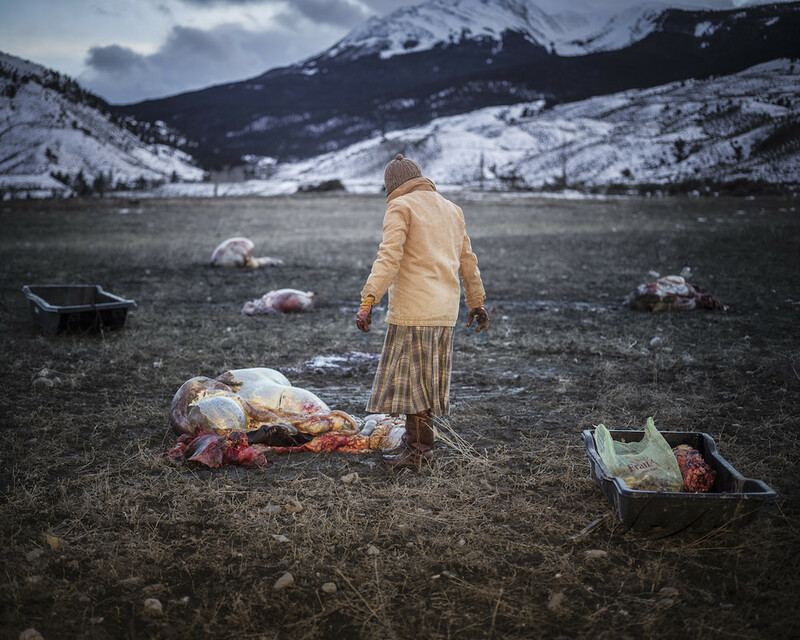 They spend a month and a half alongside the hunters, assisting where needed to butcher and pack meat. 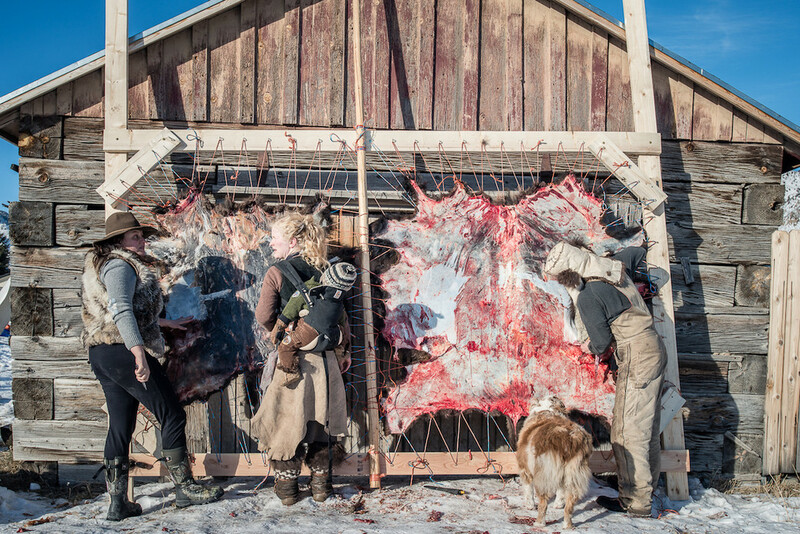 In exchange, they accept animal parts, meat, and hides, and scavenge what little remains on the carcasses after the hunters are done with them, down to rendering every last scrap of fat. 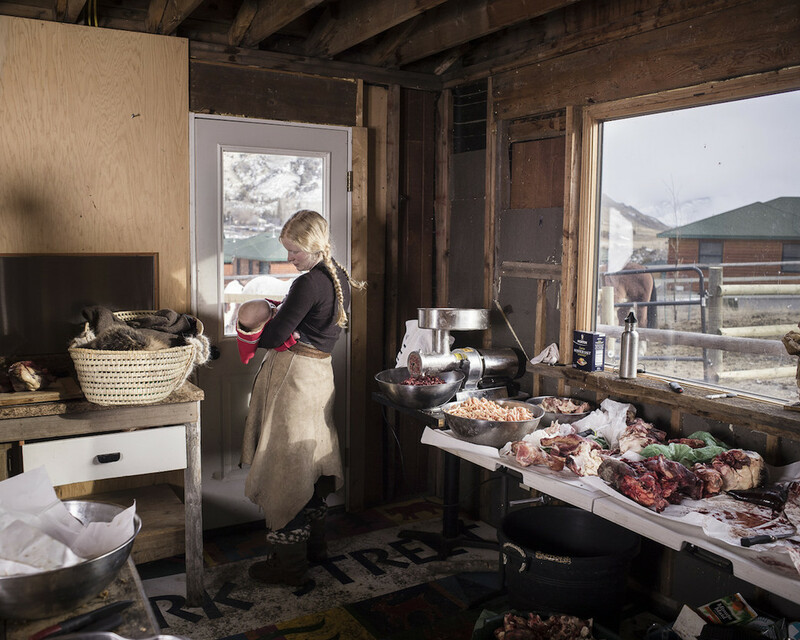 Field butchery is just part of the pre-modern skillset this group, led by self-described “Wilderbabe” Katie Russell, has sought to reclaim. 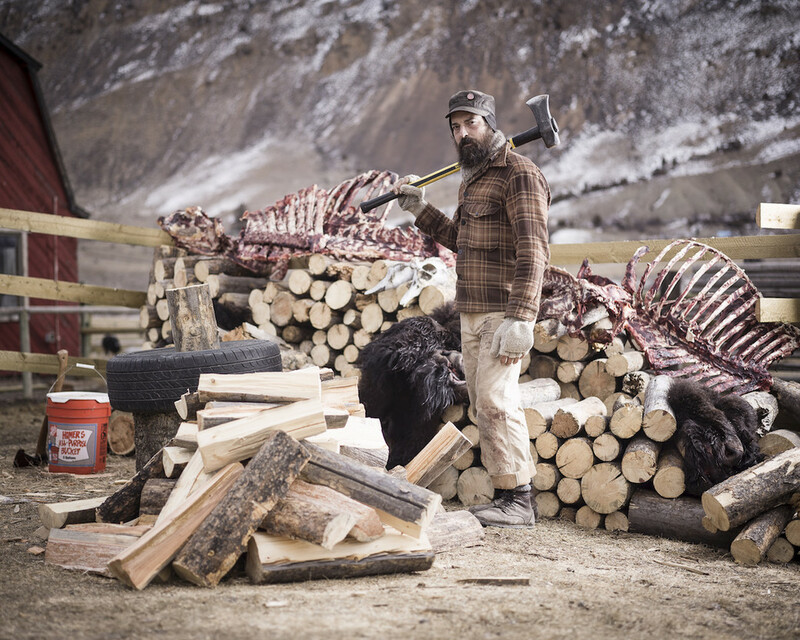 They practice flint knapping and build friction fires, use bones to make tools, and have been relearning an ancient technique for using bison brain in the tanning process. Unlike their European forebears, and the Native Americans who benefit from subsistence hunting, the Buffalo Bridgers have opted into this way of life. But they also they take their integrity seriously, and have turned away more than one curious reality TV producer. But photographer Matt Hamon’s more patient, collaborative approach appealed to the group, and the intimacy he has managed to achieve with them is evident in photos that, while not strictly posed, are certainly crafted, each one evoking an ambiguous narrative about the American West. That ambiguity is intentional, and appropriate to the historically fraught subject matter. But whereas rapacious white outsiders killed buffalo by the millions in the nineteenth century, sometimes as part of a concerted attempt to destroy the tribes that lived off of them, these ones are standing aside as descendants of those tribes hunt, and picking up the leftovers.